One of my favourite comic strips by the brilliant Posy Simmonds pictures Jane Austen being urged to make a journey forward into our own times, to bask in the worldwide adoration which she never got to experience in her own lifetime. ‘Jane! Jane! Come on Over! The Nation has voted! You are the Number One Pillar of English Lit!…You’re a Celebrity…get yourself over here,’ shouts a TV presenter in the first frame. Jane however , unable to cope with the prospect of having to answer impertinent twenty-first century questions as to her number of sexual partners, the ecological effects of writing on little bits of ivory, and her opinion of Colin Firth’s lunchbox, elects to remain in the past. In Virginia Woolf in Manhattan, Maggie Gee takes the fantasy a stage further and brings Virginia Woolf back to life. She pitches her into the twenty-first century, where her work has brought her fame and critical adulation, but where the world she wrote about barely exists anymore. The result is a novel full of comedy, but also with profound things to say to us about second chances and lives not lived, and about writers and what happens to their work when it no longer belongs to them alone. Angela Lamb (a character whose younger incarnations appeared in Gee’s earlier novels, The Burning Book and The Flood) is now a successful contemporary novelist, winner of the Iceland Prize, no less. 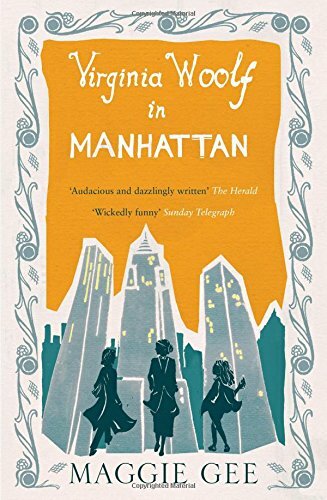 Having reached a crisis point in her marriage to her intrepid explorer husband Edward, she dumps her precocious tween daughter Gerda at boarding school and flies to New York to pursue her passion for Virginia Woolf by seeking out her manuscripts held in a private collection. It is there that Virginia herself suddenly materializes from among the bookshelves, ‘tall and dusty in bedraggled green and grey clothes’, with a ‘pondweed odour’, and Angela is landed with the job of chaperoning her heroine around present day Manhattan, and later politically perturbed Istanbul where Angela is due to give a paper at an international conference on…Virginia Woolf. Gee extracts many enjoyably droll moments from this set-up, as Virginia wrestles with contemporary conundrums, from the trivial: Katie Price and breast enhancement; the fact that fifty-year-old women go out without skirts; and the mysteries of a laptop (‘How can it work without paper?’); to the fate of her husband Leonard and the nature of her posthumous reputation (‘People still read me?’). Angela struggles to explain everything to her, from 9/11 to how the pace of change has quadrupled compared with the years which crawl by in To the Lighthouse. Meanwhile Gerda is discovering Virginia Woolf’s work for herself, in defiance of the girls at her school who are going gaga for Sylvia Plath. The novel is told in the alternating voices of Angela and Virginia, with occasional interjections from Gerda who, like her Hans Anderson namesake, embarks on a heroic odyssey of her own. Sometimes I lost the thread of exactly who was speaking, and with such a rapid ping-pong counterpoint, some of the nuances of the voices disappeared. Some might also feel that Gee has taken too many outlandish liberties in imagining how Virginia Woolf might think and feel if brought back to life. She defends herself in her afterword, assuring us that her Virginia is a ‘phantasm, one of Thackeray’s fictional puppets, always and only my own’. And yet it is a phantasm which is both funny and moving as Virginia attempts to come to terms with the consequences of her suicide, both for her husband Leonard and her beloved sister Nessa. It is also, as Gee conceived it, a wonderfully inventive ‘twenty-first- century love letter’ to an author who has been her inspiration since she read Jacob’s Room at the age of eighteen. 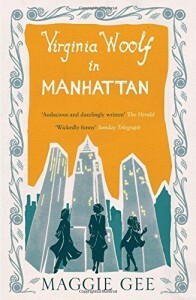 Virginia Woolf in Manhattan is, Gee says, ‘an act of cheek, an attempt not to be afraid of Virginia Woolf”. The final scene at the Istanbul conference is a triumph, reminding us not only of Virginia Woolf’s continued greatness as a writer (long dead though she might actually be) but of the wonderfully illuminating life journey that great literature can launch us on. It is also a satire on criticism, and how much of it remains an act of impertinent speculation. ‘I know this will sound strange to you, but they won’t believe what you say about your work,’ Angela tells Virginia. ‘Because I am dead?’ asks Virginia. ‘No, nothing as simple as that…It’s because some modern scholars don’t believe authors know anything about their work.’ No wonder Jane Austen chose to stay put.